As you spend the upcoming holidays gorging yourself and re-gaining all your "Biggest Loser" weight, I want you to take a minute to say some words of thanks to the goddesses who created this recipe. 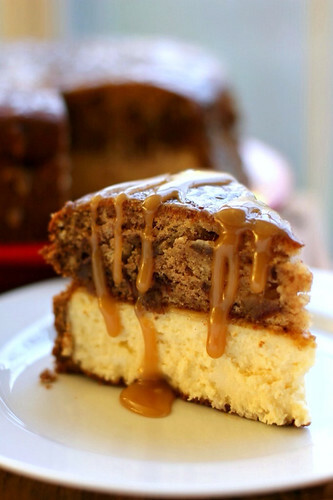 Toffee sauce meets cheesecake in a glorious melding of fat, calories, and transcendent deliciousness. You're welcome. There are no words for how delicious this dessert is. Buttery toffee sauce cascades over smooshy, date-filled sticky toffee pudding on top of a creamy cheesecake. The recipe can be made over several days and made in advance, making it convenient in addition to delectable. You can even serve slices warmed for 30-40 seconds in the microwave and with a drizzle of extra toffee sauce. A scoop of ice cream or a dollop of whipped cream would be a lovely addition. Notes: Cheesecakes are simple and super customizable. New to cheesecake making? Watch this 6 minute Cheesecake Video Tutorial for visual assistance! This recipe can be divided up over several days — you can make and refrigerate both the cheesecake and pudding in advance. Simply make the toffee sauce and assemble the day you’re serving the cake. Make the cheesecake: Preheat the oven to 350 degrees F. Lightly grease a springform cheesecake pan. Combine the cookie crumbs and melted butter in a small bowl. Toss with a fork to moisten all of the crumbs. Using a flat-sided glass, press into a thin layer covering the bottom and sides (you want it to be tall — try to get to about 2.5-3 inches high and not too thick in any one spot) of your cheesecake pan. Bake the crust for about 6 minutes and let it cool as you make your cheesecake filling. In a large bowl, beat the cream cheese and sugar on medium-high speed until well blended. Beat in the flour. Add in the vanilla and beat until well incorporated, scraping down the sides of the bowl as needed. Beat in the eggs one at a time, scraping down the bowl between each addition. Pour the filling into your crust. Bake until the top is lightly browned, puffed and cracked at the edges, and the center moves only very slightly when the pan is lightly shaken (about 40 minutes). Check while baking periodically and put a pie shield (or strips of foil) around the top of your pan to protect the crust edges if they’re getting too dark. Just don’t let the shield/foil touch the crust — it’s delicate and might crumble. Let cheesecake cool before chilling it in the fridge for at least 3 hours. Make Sticky Toffee Pudding: In the meantime, grease a 9-inch round cake pan. Place a parchment paper round in it to line the bottom, and grease the paper as well. You don’t want your pudding stuck in your pan! Sift the flour and baking powder onto a sheet of waxed paper (Doing this with dry ingredients is good because then the paper becomes a funnel for easy transport of your dry ingredients and you aren’t using an extra bowl). In a separate small bowl, gently mix the dates, boiling water, baking soda. Set this aside. In a large bowl, cream the butter and sugar together until light and fluffy (2-3 minutes). Add the egg and vanilla and beat to combine. Gradually mix in the flour mixture, scraping down the sides of the bowl as needed. Fold in the date mixture with a spatula. Pour your batter into your prepared pan and bake until the pudding is set up and firm, about 35 minutes (jiggle the pan and watch the middle). Let the pudding cool completely on a wire rack before inverting it onto a wax paper lined plate and popping it in the freezer to firm up for easy handling (or leave it in the fridge overnight). Make the Toffee Sauce: In a small saucepan, combine the butter, heavy cream and brown sugar. Bring this to a boil, whisking constantly. Boil gently for about 8 minutes over medium low heat, or until the mixture is thickened. Assemble the cake: Preheat the broiler. Spoon about 1/3 cup of toffee sauce onto the surface of your cheesecake to serve as a “glue” and gently place your sticky toffee pudding layer on top, pressing to adhere. Top this layer with about 1/3 cup of the toffee sauce and spread this around evenly on top. Place the cake under the broiler until the topping is bubbly, about 1 minute (keep a close watch! I rotated mine carefully every few seconds for even bubbling). Carefully remove the springform pan and using a sturdy spatula or two, place cheesecake on serving platter (if you’re nervous, just remove the sides of the springform pan and serve it straight from the base — no worries). Serve slices with extra toffee sauce and whipped cream or ice cream. English Sticky Toffee Pudding is always a hit at my dinners. Now I have to give this a try. Oh my lordy, I can feel my hips expanding.